BRYANT EARL BAINES tells a plain-spoken but mind-blowing story: the George Perry largemouth-bass record was topped four times in the 1960s, he says, all due to a fly named the Quittman Special. Only five men knew what this fly looks like, and four of them are dead. Unfortunately, Baines is now the target of what might prove to be the nastiest legal battle the South has seen in years. But he vows to die with the secret of how to tie the Quittman Special — if the lawyers and other people going after him can’t make him talk. All four of the largemouth that Baines claims could have broken the record took this fly; all were photographed before each was released, and two were weighed on calibrated scales. For decades, only Baines and his fishing buddies knew of these massive bass, and photographs of these fish are now part of a sealed file. The recipe for the Quittman was never written down, however, and all the flies were either lost or destroyed. Baines is the last man who knows how to tie it, so the adult children of Baines’s friends are now suing him, trying to force him to reveal the Quittman recipe. “Those people think they’re going to take that fly and turn it into some kind of plug or crankbait,” said Baines, 78, while interviewed in his life-long home in Crayville, Georgia, not far from the Florida state line. 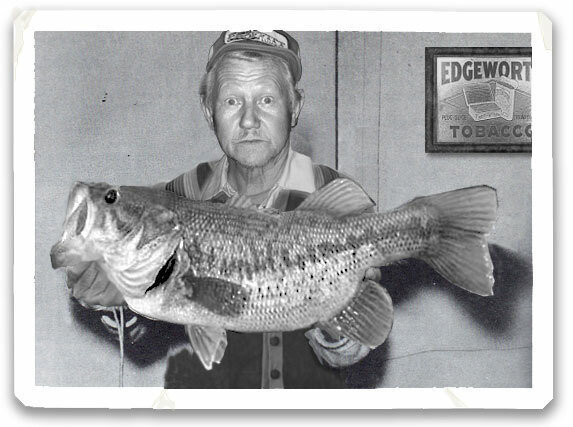 “They think they can make millions, using those old photos of us with the big bass, cause then they’re going to say, ‘Here’s the swimming plug derived from this fly that caught world-record bass.’ They’re suing me to do it.” But this legal effort already has numerous detractors, even in the lure-making business. Lawyers for the adult children of Baines’s friends are in the process of trying to authenticate the photos of the possible record fish, but will not say how they are doing so, or with whom. The IGFA and the Freshwater Fishing Hall of Fame have not issued any comment. One of Baines’s large fish, shown at the beginning of this article, is from his own photo collection: that of his 1970 largemouth, an 18.25-pound fish that inhaled a Quittman Special which Baines tied himself. Tommy Joe Higgart, Willy Summa, T. George Hett, Carleton Duke, and Bryant Earl Baines, all in their late twenties or early thirties, and who all grew up together in Crayville, Georgia, each put $50 into an empty whiskey bottle that Baines sealed with wax and buried in his backyard. The wager: To be the last man alive who caught, on a fly, a largemouth bass that broke 30 inches or 15 pounds. It was a hell of a wager. For three decades these friends fished in a series of oxbows and backwaters formed by the Immacoochee River system in far southern Georgia, treating the waterway much like their own private fishery long before it was turned into a National Wildlife Refuge in 1977. They released nearly every fish they caught and, when possible, also took a photograph of the fish. They reported their catches on an honor system. They also developed the Quittman Special, each man coming up with a part of the fly, suggesting a material, a color, or body style, basing this on experience with other patterns that had been productive. In 1959, Duke used his Leica camera to photograph Summa holding a massive largemouth bass that had inhaled a Quittman Special. In the photo, Summa holds the fish’s head at his hip, her tail reaching his mid-calf; she bulges visibly with eggs. That was the first record-size bass, and all five men immediately agreed that the places they fished in the Immacoochee and the fly they used had to be kept secret, because they suspected that there were other largemouth nearly as big in that river system, and they wanted no one — no other anglers, or newspaper photographers, or anyone with a Florida license plate — to have any idea how big the bass had grown in their home waters. On a late spring night in 1959, just after Summa’s catch, all five men gathered in Baines’s garage and swore an oath to never reveal any facts of their mission, knocking back shots of Deep Spring whiskey to seal the deal. In 1962, Higgart landed a fish that he measured with a carpenter’s tape, and found it was 39 inches long and 19.5 inches in girth. He photographed the fish lying in the bottom of his johnboat, next to his fly rod and reel, before he released it. Then, in 1965, Hett landed, measured, and photographed a largemouth that pulled a hand-held parcel scale to 24-pounds, 15-ounces; the scale needle is visible in the photo, according to Baines. Higgart topped that fish in 1968 with an amazing 25-pound, 7-ounce fish that vomited a whole bullfrog when brought into the boat before it was weighed; Baines took the photograph while Higgart used a different postal scale to record the fish’s weight. Duke never caught a fish over 20 pounds, but did photograph an amazing series of a dozen 17-pound-plus fish that he caught from 1962 to 1979. Baines’s 1970 fish, pictured here, weighed 18.25 pounds on a hand-held Langley De-Liar fish scale. He kept this fish, and the photograph was taken in the barbershop in Crayville. The five men kept fishing well into their late sixties, each one hoping to win the tontine. Tommy Joe Higgart, holder of the biggest catch, died in 1999, aged 74. Willy Summa died in 2000, aged 75. T. George Hett died at age 77 in 2002. Carleton Duke died in 2007, having reached 80. Bryant Earl Baines is the last man alive now. Last year, he dug up the whiskey bottle and gave the $250 to the Crayville Public Library. “Everyone was proud of the fish they caught, and didn’t want any recognition beyond just what we gave each other,” Baines said. “The problem was that damn file — the place where we kept all our measurements and photographs. I had the money bottle, but Carleton Duke had held on to the file. His children found the file, and they been raising hell ever since. They got Tommy Joe’s kids, and George’s kids, and Willy’s kids all involved, too.” Baines often shakes his head and winces when he discusses his situation. He had no desire for this run of record-bass fishing to end in a fight with the children of his best friends. The Duke inheritors — a son, Archibald Banes “Banny” Duke, and two daughters, Willa Duke-Steverson and Maureen Duke-Bolton — each spoke through an attorney for this article. Carl M. Scartz, attorney for Mrs. Duke-Bolton, also based in Atlanta, believes that the photographs can be authenticated to the point that the fish’s size can be accurately determined. “There’s no question in my mind that two of these fish break the Perry record,” he said. Attorneys for the Duke children plan to approach several record-keeping bodies and photographic experts to authenticate the photos. The Duke, Haggart, Hett, and Summa inheritors have all agreed to not release the photos publicly until the images are authenticated, and to have equal shares in ownership of the photos. As for the recipe for The Quittman Special, that is a bit more complicated. The method of tying this fly is a form of intellectual property, according to James J. Torrance, an intellectual property lawyer with Broadman-Stokes-Curtis, of Washington DC, and who has served as an advisor on proprietary matters to the Smithsonian Institute and the Food and Drug Administration. “There’s little concept of copyright in fly-tying culture,” Torrance said. “And you could never obtain so many copyrights that you could protect fully every slight variation of your fly. Attorney Majors has consolidated the suits for Banny Duke and the children of Hett, Haggart, and Summa, naming them all as plaintiffs in a single suit against Baines, filed in Lowndes County Court. Lawyers have filed a suit each for Mrs. Duke-Steverson and Mrs. Duke-Bolton in the same court. Baines’s saving grace is that his two sons, Bryant Jr. and Dwight Baines, are both attorneys and have taken up their father’s case pro-bono (Baines also has a daughter, Sue-Ellen, by his late wife, Constance, who died in 2003). Despite the possibly historic import of the fishing history that Baines and his friends documented, detractors emerged quickly as the story came to light. Representatives for the IGFA and Freshwater Fishing Hall of Fame would not comment on the subject when contacted. Donny Ray Rudd, Director of the Southern Largemouth Angling Group, scoffed. The one photo available for publication — the image of Baines with his 18-pounder — has already set wild speculation. Some have declared this fish is not big enough to be 18 pounds, while others suggest that the fish in that photo is one of the record-breakers — possibly Higgart’s — and that Baines is simply posing with it. Baines insists that’s his fish. That performance aspect is at the heart of the lawsuit thrown at Baines. What was it about the Quittman Special that made it so effective for big bass? Baines tied the original set of twenty-five flies that he doled out to his friends before everyone learned how to tie the pattern. He won’t mention the materials he used, but he said that the Quittman Special does have some flutter to it. “I greatly admired Robert Page Lincoln’s flies, from back in the day,” Baines said. “Depending upon how you tied his big streamer, you could get a lot of movement if you fished it below the surface. But the Lincoln also floated, so you could imitate a dragon fly or some other big bug fallen next to a lily pad.” Baines’s enthusiasm for the Lincoln streamer is telling. And he is unmoved by any suggestion that a fly could never catch a world-record largemouth. Many fly fishers most likely share his enthusiasm. Suspicions began early for Baines and his friends. People in Crayville in the 1960s knew the five men were up to something, but the open secret during their heyday wasn’t the fish — it was how to tie the fly. Baines and his buddies always clipped the fly from their tippet before they took a photo or came into town, and didn’t put any Quittmans in their fly boxes. Each man had sewn a special pocket in his fly vest, and hid the sizeable flies there, said Baines. 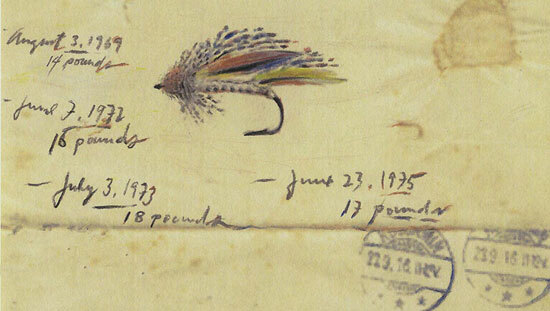 They attributed their catches the typical poppers or moth-pattern bass flies used back then. “Most of the time, we could just say, ‘Oh, I caught that one on a white popper,’ or something like that,” Baines said. “But then we got into trouble once, because Carleton and Tommy both come into town with a nice bass each, about eight pounders, and they say they got them on moth flies. Well, a couple smart alecks grabbed Carleton’s and Tommy’s fly boxes and went through them. They didn’t find one damp fly, and they started talking and whispering. So at first, everyone thought we were using mud-dogs or shellcrackers and just saying we were using flies.” Rival anglers turned into spies, and soon the five members of the tontine were being followed to their fishing spots. At first, they didn’t realize they were under observation, but being spied upon actually helped them. Three of the anglers — Summa, Hett, and Duke — cast their Quittmans with fiberglass fly rods, while Baines and Higgart used heavier-tipped bamboo rods that Higgart’s father had made for bass fishing. Pfluegers and Sportscrafts were the usual reel types. The five friends all used monofilament as tippet, and rarely lost fish to break-offs. Higgart reportedly fought his 25-pounder for an hour. By the early 1970s, the Immacoochee system was on the map as big-bass water, and even turned up in articles in Sports Afield, Outdoor Life, and The Atlanta Journal newspaper. The five friends had to take greater pains to keep their best spots and the fly a secret. Baines refuses to say just how large the Quittman Special is. He does say that he fished it both on the surface and in the water column to middle depths, and that it was designed to displace water and offer a very visible profile. “We handled those flies like they were nuclear secrets,” he said. “Had a special pocket in our vests. Kept them under lock and key in the house. You didn’t leave them in your car or put them on your hat. We knew we had a super secret weapon with the Quittman, so we handled them like that. Top secret.” Each member of the group tied only so many Quittman Specials per fishing trip, and used them until they were sufficiently worn out, and then destroyed them. No one ever gave one to an angler not in the betting pool. But now, if the children of all his old friends and their lawyers are successful in their suit, Bryant Earl Baines will essentially have to give everyone a Quittman Special. The case is slated for preliminary hearings in early May. “My health is good,” Baines said. “I’m no young man, but my doctor tells me I’m certainly going to live long enough to have to see this thing through to the end. My sons are a godsend, but I wish I had my ol’ boys around me now, too. They’d’ve never let this happen.” Baines paused, gazing out his living room windows to a front lawn of budding dogwoods and tall magnolias.